Properties in Rivière du Rempart District average 4.5 out of 5 stars. 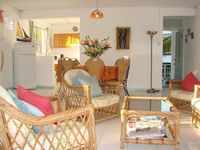 Private luxury villa with pool, spacious tropical gardens in quiet location. Property 4: Private luxury villa with pool, spacious tropical gardens in quiet location. Exceptional location in a private creek in Pereybère, Grand Bay. Property 27: Exceptional location in a private creek in Pereybère, Grand Bay. A beautiful accommodation so you don't miss home, even when travelling. Property 33: A beautiful accommodation so you don't miss home, even when travelling. Property 38: Newly built townhouse on the beach. The villa is on the beach side at Cap Malheureux, the dream spot of Mauritius. Property 39: The villa is on the beach side at Cap Malheureux, the dream spot of Mauritius. Airconditioned room wit kitchnette ideal for individual, family and groups. Property 40: Airconditioned room wit kitchnette ideal for individual, family and groups. Spacious Private Duplex Villa PROMO £60 MAY-JUNE 2019(2-8 PAX)Pereybere. Property 47: Spacious Private Duplex Villa PROMO £60 MAY-JUNE 2019(2-8 PAX)Pereybere. Paradise of calm, white sand and turquoise water. We had a lovely family vacation at Mr. and Mrs. Noel house. It is located on a very calm beach. Only a few steps away form white sandy beach and turquoise water. Owners were extremely friendly and maids cook delicious foods. Thank you again for making our vacation a dream come true.